"Don't Look Back" is a fascinating exercise in self-revelation carried out by Bob Dylan and friends. The portrait that emerges is not a pretty one. Indeed, those who consider Dylan a lone, ethical figure standing up against the phonies will discover, after seeing this film, that they have lost their hero. Dylan reveals himself, alas, to have clay feet like all the rest of us. He is immature, petty, vindictive, lacking a sense of humor, overly impressed with his own importance and not very bright. The remarkable thing is that Dylan apparently approved of this film. It's easy enough to make a film putting someone down; all you have to do is slant your material. But to make a film putting YOURSELF down--and then not even to realize it! 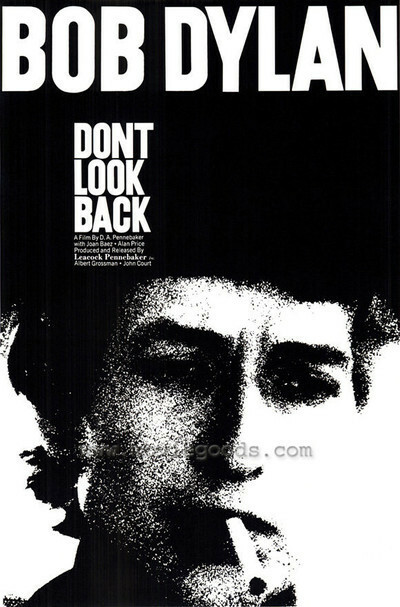 "Don't Look Back" was made during Dylan's 1965 tour of England. Although the film is arranged in loose chronological order, there is little obvious editing within each scene. This takes advantage of cinéma vérité's strong point--its ability to show exactly what happened, moment by moment, the bad along with the good. In a particularly cruel scene, for example, we see Dylan being interviewed by a reporter for a student newspaper, and then mercilessly putting down the miserable kid. The room is filled with Dylan supporters, who laugh and sneer on cue as Dylan accuses the student of being middle-class and stupid. "I don't need you," Dylan boasts. "I made it without the newspapers." Some might assume that if Dylan really had it made, he wouldn't need to crucify wretched sophomores to prove it. Again, there's a scene during a party in Dylan's hotel room. Someone throws a glass out the window. A long rhubarb ensues in which Dylan demands to know who threw the glass. Then the hotel manager appears, and Dylan's manager calls him several varieties of obscene names. All of this, remember, is being done with the knowledge that the camera is grinding. Or take, as another example, this transition. "How did you start?" Dylan is asked. The camera fades to a cotton field. Dylan is dressed in blue denims and a work shirt, and he's surrounded by field hands. He's singing a song of work and freedom. Then the scene dissolves to Dylan in a concert hall. What are we supposed to gather? That he started as a proletarian folk singer like Woody Guthrie (absurd), or that his roots are still with the people, despite his success (insulting). Then there's the interview with the reporter from Time magazine. "'You can't print the truth," he snarls at the man from Time. "You'd go off the stands in an hour if you printed the truth about anything. I could explain to you why I'm not a folk singer, but you'd never understand. You can't tell the truth," etc, etc. The man from Time asks what the truth is. "Well, you know," Dylan says, "the truth." The reporter asks for an example. Dylan is at a loss. "You know, man, the truth. Like--well, like a picture of a tramp vomiting. Yeah, and next to that a picture of Rockefeller...."
Dylan's songs give a deeper, more honest impression of their author. And I don't think this movie should detract from them. When Dylan sings, he has hold of something precious. It is only his pathetic private life, as he has revealed it in this film, that should be dismissed or regretted. A footnote: The one person in the film who comes through shining is Joan Baez. She remains, as always, intelligent and gentle. One wonders if she did not sometimes grow impatient with Dylan, who shares her talent but not her charity.